Design, Draw and Create Workshop – Chatsworth Road Festival. Come to an afternoon of hands on creative workshops with professional artists who will share their inspiration and techniques with you. 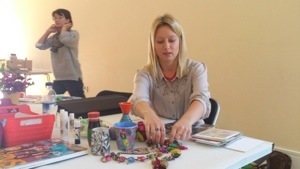 Choose two activities from ceramic tiles, textiles, print or collage. This is the third year running for this popular event organised by Clare Gage, local award-winning ceramicist. Pre booking is essential and the cost is £8 per person. All abilities welcome but ages 16 and over. 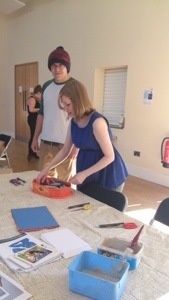 Clare Gage prepares for the ceramic tiles workshop.